LOOKING TO TAKE ADVANTAGE OF OUR SPECIALS ?? *Spring special applies only to properties and date ranges specified for stays (March 22 - April 30, 2019 for 3+ Night Stays Only). Good for new reservations made on or after March 21, 2019, and based on availability. No refunds or discounts on previously made reservations.Special must be mentioned/provided at time of booking. All Sunriver bookings are completed over the phone with reservation specialists. Specials cannot be applied retroactively. Prices do not include tax/fees. Cannot be combined with other specials or rates; minimum night requirements apply; 1 discount per stay. Specials may be discontinued without notice. 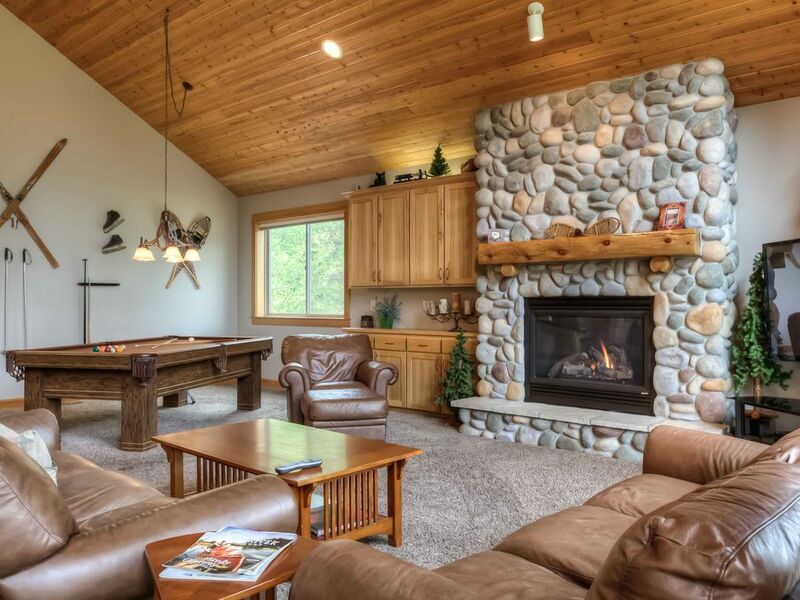 Beautiful, Luxury 3,600 Square Foot, Lodge Style, vacation rental located in Sunriver resort. Unlimited use SHARC passes included! Experience the luxury of this wonderful, 3600 Square Foot, 6 Bedroom, 5.5 bath, Lodge-Style vacation home in SUNRIVER, OREGON. This gorgeous home is ready to make your vacation a dream. Extensive use of logs, natural wood, granite and slate in an open 'great room,' six bedrooms, five and a half bath home provides a luxury home with the rustic lodge feel of Sunriver. With FOUR MASTER SUITES, ALL with KING BEDS, this home is ideal for a group of couples who all like to have their own room with private bathroom. This is also an amazing home for families. Huge over-sized garage is heated and has ping-pong, air hockey, foosball tables,and TV/Stereo also has room for three cars. Everyone will enjoy playing the classic Donkey Kong arcade video game. Perfect location near the mall, SHARC, and Marina between circles three and four. When you want a wonderful, luxury, vacation rental with all the little extras, this home is for you! Aspen Lodge comes with passes to NEW SUNRIVER AQUATIC CENTER which includes indoor and outdoor recreation pools, 15-person outdoor adult hot tub, outdoor lazy river, water slides and tot pool, sand play area, playground, basketball court, bocce ball, indoor/outdoor café, picnic areas, outdoor amphitheater, winter sledding hill, event/meeting rooms, etc. Blue Pacific Vacation Rentals has been in business in since 2001, we're a boutique management company that specializes in luxury properties on the Oregon Coast and in Sunriver. The benefits of using a trusted name is that we offer local support and assistance, 24/7 emergency guest assistance, and safe and secure bookings. The ‘Service Fee’ included in the quote is a HomeAway/VRBO fee and is NOT a fee charged by Blue Pacific Vacation Rentals. Rates are subject to change until confirmed. Renters must be 25 or older to rent. Deposit of 50% due at time of booking reservation. Remainder of balance is due 60 days prior to arrival. A complete rental agreement (terms and conditions) for the rental are emailed to the guest for their E-signature after a booking is confirmed. The Rental agreement must be signed and returned within 3 days or reservation will be cancelled. Additional information about HOA rules are available upon request. SAME DAY BOOKINGS - We are unable to accommodate bookings made on the day of arrival. PETS/ANIMALS-- Pets or any type of animal are not permitted in the rental units under any condition. SMOKING-- This is a NON-SMOKING property and complex. Smoking is not permitted in the unit or in the common areas of the complex. Anyone caught smoking on the premises, will be subject to fines. OCCUPANCY-- Occupancy is specifically LIMITED to the MAXIMUM number of people designated for that particular property, includes children 2 or older, and anyone in the property at any time during your stay (not just sleeping there). Information on occupancy limits for a particular unit may be viewed on Blue Pacific’s and Airbnb websites. AGE CRITERIA-- You must be at least 25 years of age to rent from Blue Pacific Vacation Rentals. Children are welcome when travel with a parent or guardian. HOUSEKEEPING-- The unit will be professionally cleaned prior to arrival and after guest departure. Guests shall leave premises in clean, undamaged condition, similar to the way they found it. The cleaning fee covers laundry, sanitization, and cleaning associated with “normal” use. INSURANCE-- It is strongly recommended that Guests purchase travel insurance because unforeseen and unexpected events can occur before you leave or when you are away from home. PARKING-- Information about parking will be noted in the check-in instructions received by the Guest prior to arrival. SATURDAY ARRIVALS/DEPARTURES-- Saturday arrivals or departures may be subject to scheduling approval/review in our Coast Properties (peak and off-peak season), and during the off-peak/ski Season in Sunriver. A reservation representative will review the reservation and call you and address the issue if this is a problem. All reservations are pending and subject to review of our staff prior to finalizing. Blue Pacific Vacation Rentals has been in business in since 2001, we're a boutique management company that specializes in luxury properties on the Oregon Coast and in Sunriver. The benefits of using a trusted name is that we offer local support and assistance, 24/7 emergency guest assistance, and safe and secure bookings. Rates are subject to change until confirmed. Renters must be 25 or older to rent. All bathrooms have beautiful slate floors and slab granite counters. Spacious living room with large TV and Pool Table. Gorgeous Gourmet kitchen with slab granite counters and stainless appliances. We enjoyed Spring Break with three families in this beautiful house. We especially loved the large great room and family room. The bedrooms for us all nicely. The games in the large garage kept a kids busy, and the bikes were an added bonus. Thanks for a comfortable large house. Thanks for sharing your lovely home with our family. A fun extended weekend for all that included skiing, skating, and shopping. The extra large dining table was an awesome feature....we were able to sit, visit and play games all at the same time! We highly recommend this house for any and all wanting a cozy house to relax and enjoy. the property was excellent for our requirements. exceedingly well equipped. great room worked well. well equipped, well located, poorly supplied with bath soap. Loved this home! Spacious, comfortable and had a lot of fun! Wonderful gathering place for large family. Loved the comfortable lodge decor. Kitchen is great with 2 dishwashers and 2 ovens but could use some updated small appliances like coffee maker. Loved the games - so much to do! Ping pong paddles need to be replaced. (It's always the small things) Bedrooms and bathrooms are well done and really help balance the togetherness and privacy. Management company was not great to work with and needs to ensure details are cared for (outdoor lights burned out, previous guest debris on deck, dates and rates match on website) We loved this home for our snowy, winter weekend in Sunriver! Our extended family of 13 found Aspen Lodge to be the perfect luxury rental. Clean, beautifully appointed, furniture, appliances, cookware, televisions, games, electronics all in excellent condition. We never had to wash dishes, glasses or tableware in order to have enough at any time because the cupboards were full and with two dishwashers, two ovens and an extra refrigerator/freezer in the garage it was not only easy but pleasurable to prepare meals for a large group. The heated garage was a bonus for some of our group to challenge each other on games in the garage while others played pool in the great room and others played in the bonus room downstairs. The bedrooms were not only comfortable but the linens were top quality, the view of falling snow from the large windows was breathtaking and we look forward to returning in the summer to take advantage of the good selection of bikes and easy access to Sharks and the Village. Aspen Lodge comes with passes to NEW SUNRIVER AQUATIC CENTER which includes indoor and outdoor recreation pools, 15-person outdoor adult hot tub, outdoor lazy river, water slides and tot pool, sand play area, playground, basketball court, bocce ball, indoor/outdoor café, picnic areas, outdoor amphitheater, winter sledding hill, event/meeting rooms, etc. Opening May 2012.